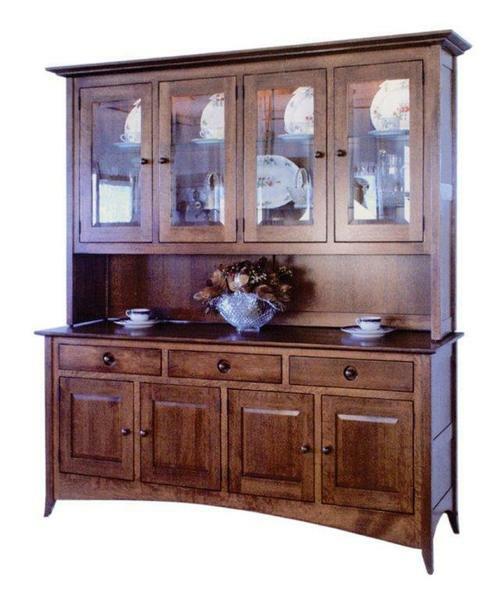 A masterful display of woodworking, the Amish Shaker Hill Four Door Hutch has room for everything. For all the entertaining, displaying and storing you like to do, this shaker style furniture is up to the task and will look stunning as it stands in your home. Shaker style furniture keeps it simple with little decoration. It lets the solid wood beauty stand out even more, The Shaker Hill has four spacious top cabinets, a grand display buffet area, three drawers and four lower cabinets. Details like the curved lower ridge and angled legs speak to the quality craftsmanship behind the furniture. There are lots of options to choose for a custom made hutch. Our helpful video, How to Design Your New Hutch or Buffet in 7 Simple Steps offers a walk through guide.